Services charge for AMC Pacific Place: $10/ticket. The ticket price of 2D《Avengers: Endgame》, please click here for details.The ticket price of 3D《Avengers: Endgame》, please click here for details. ​The ticket price of 《Asbury Park: Riot, Redemption, Rock n Roll (2019)》, please click here for more details. The ticket price of 《Khalid: Free Spirit (2019)》, please click here for more details. The ticket price of 《The Met 2019》, please click here for more details. ​All credit card discount, VIP complimentary ticket, AMC Pacific Place ticket exchange coupon, American Express complimentary ticket are not applicable to The Oval Office. All credit card discount(except American Express Friday Buy-1-Get-1-Free offer), VIP complimentary ticket, American Express complimentary ticket are not applicable to these films with special engagement with film distributors: 《Avengers: Endgame》(2019/04/24 – 2019/05/07). VIP complimentary ticket, American Express complimentary ticket are not applicable to 3D movies. Morning show: on or before 11:00a.m. for AMC Pacific Place. Children ticket for aged 11 or below. Senior ticket for aged 60 or above. People must present proof of age before purchase ticket and admission to the house. Valid ticket is also needed for infant. Student must present valid full time student ID card before purchase student ticket and admission to the house. AMC Pacific Place is one of Hong Kong's leading stadium-seating cinema, screening a variety of blockbusters and serving gourmet canapés, fine wine and drinks to create an exceptional viewing experience. 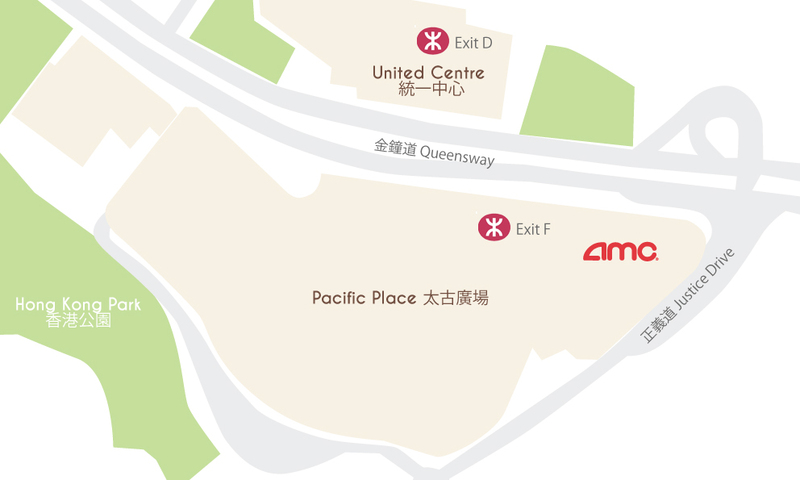 A Mecca for Hong Kong film buffs, the six theatres at AMC Pacific Place regularly screen both international and local movies and also host blockbuster previews and gala shows. Theatrical enjoyment is relayed from theoutsize wall-to-wall screens via USL 8 Channels audio system. Most importantly, each of the 581 supremely comfortable French leather stadium seats is 1.2 metres wide with ample legroom. The largest house in the cinema, the AMC Plus House, is the first Asian cinema to deploy the AuroMax 3D Surround Sound System, developed by Barco. AuroMax delivers a richer and most natural immersive sound effect. The three distinct layers and a vertical stereo field on the screen divided over six screen channels enlarges the listening sweet zone beyond the central zone and allows for the best listening experience available. The speakers are all featured in the JBL Professional Top Series, featuring the most precise and clear surround sound effects. AMC Plus also boasts an exclusive laser-based projection technology for a brighter, crisper and clearer cinematic experience. The Oval Office is the name of AMC Pacific Place’s VIP house. It offers you an upgraded level of cinema-going experience. Our wine bar provides a great place to meet or relax before or after the movie. It is a place for fun and pleasure, a cinema for the most fabulous movie entertainment!